Are you dreaming about moving to a galaxy far, far away? Well you don’t actually need to go that far, as 4 Star Wars film locations are here in Italy. Plus they are all in great areas to buy a property. The sweeping marble staircase inside the Palace of Caserta is the luxurious location for the Theed Royal Palace of the Royal House of Naboo in The Phantom Menace and Attack of the Clones. Film maker, George Lucas chose the interior of the Palace of Caserta for the Theed Royal Palace as he was looking for an Italian Renaissance appearance for the planet. It also stood in for the Vatican City in 2009’s Angels & Demons, starring Tom Hanks. Built during the 18th century The Palace of Caserta is said to be the largest royal palace in the world by volume (two million cubic metres). Constructed for the Bourbon King of Naples it has 1,200 rooms, 34 staircases and 143 windows on the principal façade. Inside there are many amazing stuccoes, reliefs, frescoes and sculptures. The Palace is one of 53 Italian UNESCO World Heritage Sites. The aqueduct in the enormous park gardens is also listed. It even has an enchanting landscaped “English garden”. Ryanair, easyJet and British Airways all offer direct flights from London to Naples International Airport, just 24 kilometres from Caserta. Caserta is easy to get to, as there is an exit on the motorway which runs from Naples to Rome. Even Salerno is less than an hour drive away. There is also a train station directly in front of the Palace. Once you have been inspired by the palatial architecture head south of Naples (Napoli) to the popular property hot spots, to find your own palace in Italy. The Campania region was a favourite place for the Romans to spend holidays and retire to. They called it “campania felix” (Happy fruitful land). The same things that attracted people to the area centuries ago are still making visitors fall in love with the region and want to buy homes here. Whether you want a great holiday home or permanent residence, there is certainly plenty to see and do in Campania. 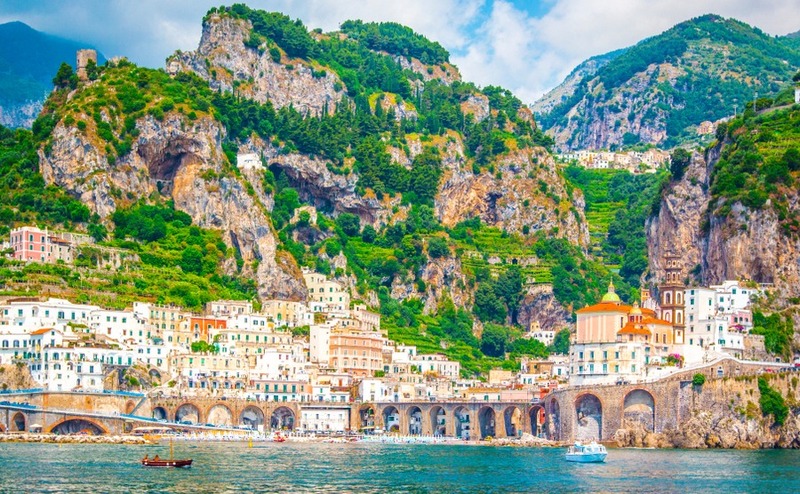 As well as the colour and bustle of Naples you have beautiful Sorrento and the stunning Amalfi Coast. Mount Vesuvius adds drama to the lush landscape, whose fertile soils help to produce some of the best pasta, tomatoes, mozzarella, pizza and ice cream in Italy. The ruins of Pompeii have fascinated British visitors since it’s discovery in the 18th century and in 2017 it attracted 3.4 million visitors. The rich and famous are also drawn to the chic islands of Capri and Ischia. You can find both very expensive and cheap homes in Campania. The popularity of the Amalfi Coast and Capri put them at the higher end, and you’ll find very few properties coming up for sale here. If you do manage to snap up a property the holiday rental returns are excellent. Head further south to the Cilento coast and inland a bit for more reasonable sea view prices. If you are looking for a bargain home you need to move inland where you will find countryside properties and town houses in quiet villages such as around Calitri and Roccaspide. Property in Campania on rightmove : one-bed apartment in Naples from €267,000, Country houses to renovate from €55,000, village houses from €85,000. Solo: A Star Wars Story, is currently the top film at Italian cinemas, earning over three million at Italian box offices. The spectacular scenes of the snowy planet of Vandor were filmed in the Italian Dolomites. While on location, the film crew recorded panoramic shots of the famous Tre Cime di Lavaredo (Three peaks of Lavaredo), in the Belluno province of Trentino – South Tyrol. In the film Han Solo and Chewbacca attempt to liberate a container from a train as it speeds around the mountains and the peaks can be seen behind. Monte Piana and Lake Antorno were also used in the film. Villages of the Dolomites have as many Austrian influences as Italian ones. The Dolomites are a mountain range that forms part of the Italian Alps on the Italian/Austrian border and is yet another UNESCO World Heritage site. In this case it is because of the beautiful mountain landscapes, with vertical walls, sheer cliffs and a high density of narrow, deep and long valleys. Imagine rolling green hills dotted with charming village chalets, with a backdrop of dramatic craggy mountains piercing the sky. Villages of the Dolomites have as many Austrian influences as Italian ones and many residents are bilingual. The whole region of Trentino-South Tyrol is like a scene from a Christmas biscuit tin. Here you’ll find wooden chalets covered in flowers and pretty villages with pointed church towers. The Winter Olympics brought the world’s attention to the village of Cortina d’Ampezzo back in 1956. But it had been a favourite resort for wealthy Italians long before and remains a very expensive place to buy. Other well-known ski resorts include Madonna di Campiglio, Canazei, Moena and San Martino di Castrozza. These are popular in both winter and summer for their natural surroundings, sports activities, and fun. Bolzano (Bozen) is the largest city in the region and regularly ranks highly for “Best Quality of Life in Italy”. There are three possible airports depending on which part of the region you are driving to. You can fly to Venice Treviso airport with Ryanair. Alternatively you can fly with BA to Innsbruck and drive across the Austrian border. Another possibility is to fly with BA, easyJet or Flybe to Verona. Drive times: Treviso to Cortina d’Ampezzo 2hrs, Innsbruck to Cortina d’Ampezzo 2hr30, Verona to Trento 1hr, Verona to Bozen 1hr35. 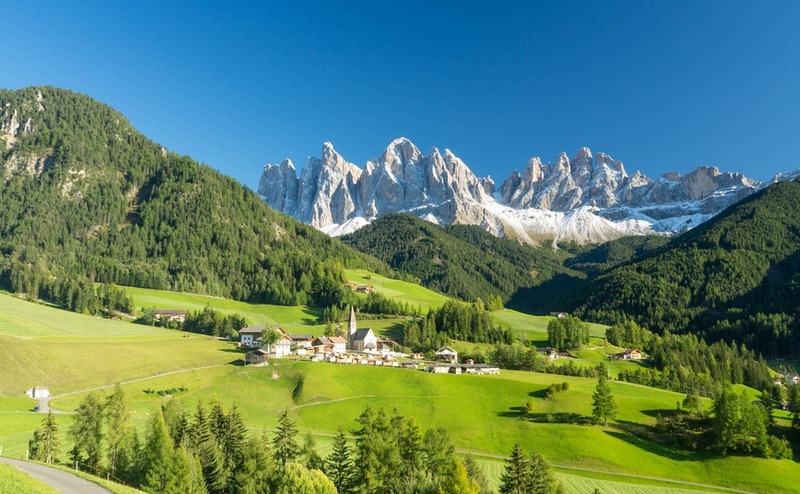 The real estate market is roughly divided into three geographic areas: Firstly, Val Gardena, which is very Austrian, then Val Badia which is one of Italy’s best-known Alpine resorts, with less expensive properties. Finally, Cortina d’Ampezzo, one of the priciest and most exclusive ski towns in the world. Property doesn’t often come up for sale in these areas, as it is quite an exclusive market. Most properties on the market in the region are 2 bedroom apartments within larger chalets. You will find some more affordable properties in Trentino-South Tyrol around Trento and Bozen. Apartments start at €200,000, two-bedroom stone and wood chalets from €495,000. Villa del Balbianello on Lake Como sets the scene for Anakin and Padmé’s wedding on the planet of Naboo in Episode II, Attack of the Clones. This idyllic location has since become a much sought-after wedding venue for Star Wars fans from across the world. The extremely beautiful Loggia Durini was where Anakin performed his Jedi meditation in the morning. Many a romantic couple have re-enacted the first kiss between Anakin and Padme near the wall overlooking the lake. About five kilometres away is also the field where the picnic scene was shot. Villa del Balbianello on Lake Como sets the scene for Anakin and Padmé’s wedding on the planet of Naboo in Episode II, Attack of the Clones. This beautiful villa is a property located near Lenno and Ossuccio, in one of the most scenic positions on Lake Como at the tip of the Lavedo peninsula. Villa del Balbianello was built in 1787 on a pre-existing Franciscan monastery. It’s hard to believe that at one stage it fell into neglect and was left empty for 30 years. Its last owner, the explorer Guido Monzino, who died without heirs in 1988, left the villa to the Fondo Ambiente Italiano who, like the British National Trust, protect beautiful places for future generations to enjoy. The property still displays hundreds of objects collected by the adventurer from maps to furniture and ancient art objects. The house and gardens are open to the public and you can even arrive there by boat. Life around Lake Como is pleasantly relaxed. After George Clooney bought a villa in Laglio, he is quoted as saying that it was “a pure investment decision. Then I realised how beautiful life was in Italy and how it helped calm me and not feel so pressured”. There is a good ferry service on the lake connecting villages. So if you want to do less driving, a home near a ferry stop can be very useful. The area is very popular with tourists, which is great for anyone planning to provide holiday accommodation, but if you want peace and privacy avoid buying a home near a main road. For peace and quiet head into the hills, where you will find stunning panoramic views. 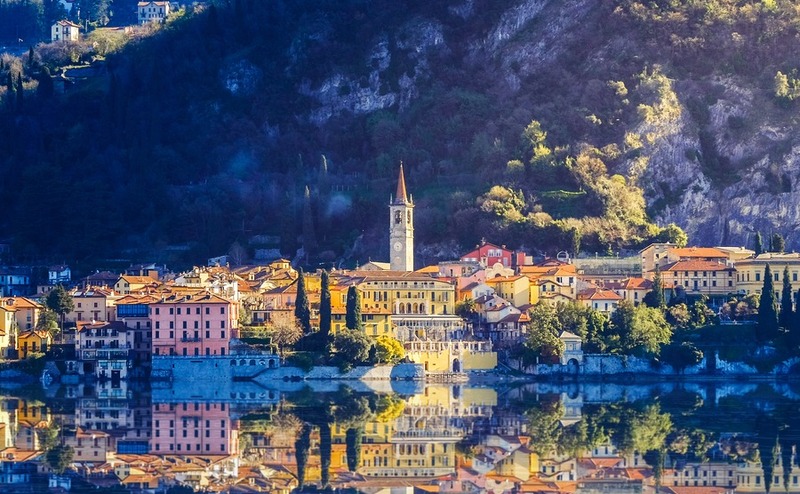 Lake Como is also popular with those wanting to keep physically active, with many opportunities to enjoy walking and cycling among unspoilt nature. There are so many enchanting villages to visit and cultural events to discover. Travel by plane to Milan with Ryanair, Flybe, easyjet, Alitalia or British Airways. From London you can fly to Milan in less than two hours. Lake Como is less than an hour and half drive from Milan’s Malpensa airport and you can get from Milan Central station to Como in an hour by train. To buy an apartment with a view of the lake you could pay upward of €300,000 but it is possible to find bargains further back from the lake and in the villages. You can then live away from the tourists and visit the expensive locations at your leisure. When viewing property be aware that at certain times of day the sun may be behind the mountains, creating shade on the house. A three-bedroom Villa close to the lake will cost you well over a million and an eight-bedroom villa on the waters edge costs about €9 million. But what price can you put on those amazing views. If a Grand Villa is too large for your needs anyway, you can still enjoy living in one, as some have been split into separate apartments and have beautiful communal gardens. There are some lovely Lake Como properties for sale on rightmove. Mount Etna is on the UNESCO World Heritage List for its geological peculiarities of planetary relevance. It is the highest volcano in Europe, and one of most monitored, as it is also one of the most active in the world. Rising to a height of more than 3327 meters it and can be seen from miles around. Its spectacular eruptions arouse the interest of scientists and visitors from all over the world. The most popular tourist activity is an excursion to the craters, which is done safely with an expert guide. There are also many sports to enjoy on Mount Etna including mountaineering, trekking, rafting, paragliding, climbing and horse riding. You can pass through woods and orchards and see rivers and gorges as you climb the nature trails up to the lunar landscape. There are many trees including the oldest and largest in Europe, the “Hundred Horse Chestnut”. Reportedly, the tree is 3-4000 years old and has been awarded with the title of UNESCO Messenger of Peace. Amazingly, you can also enjoy winter sports on the snow-capped slopes of Mount Etna. The ski resorts of Nicolosi in Piazzale Rifugio Sapienza (Southernside Etna) and Piano Provenzana – Linguaglossa (Northernside), provide lifts leading to red and blue downhill ski slopes. So, you really can be on the beach in the morning and on a ski slope in the afternoon. Small seaside villages face the Ionian coast of Etna. Mount Etna is on the UNESCO World Heritage List. It is the highest volcano in Europe, and one of most monitored, as it is also one of the most active in the world. Amazingly, you can enjoy winter sports on the snow-capped slopes of Mount Etna. The ski resorts of Nicolosi in Piazzale Rifugio Sapienza (Southernside Etna) and Piano Provenzana – Linguaglossa (Northernside), provide lifts leading to red and blue downhill ski slopes. Mount Etna is in Catania province on Sicily’s east coast, but the province of Messina is also very close to Mount Etna and includes the pretty village of Taormina. Its beaches on the Ionian sea are very popular and include that of Isola Bella which is accessible by cable car. Small seaside villages face the Ionian coast of Etna. From San Giovanni Li Cuti and the small port of Ognina to Acitrezza, you can pass through Acicastello, Capomulini and on to Santa Maria La Scala. At the Nature reserve of Timpa is the hamlet of Santa Caterina, which has beautiful views overlooking the sea. Further on, there are the seaside villages of Stazzo, Pozzillo and Torre Archirafi. These villages are referred to as the “Borghi della lava” (villages of the lava), renowned for their breath taking views and Mediterranean flavours. 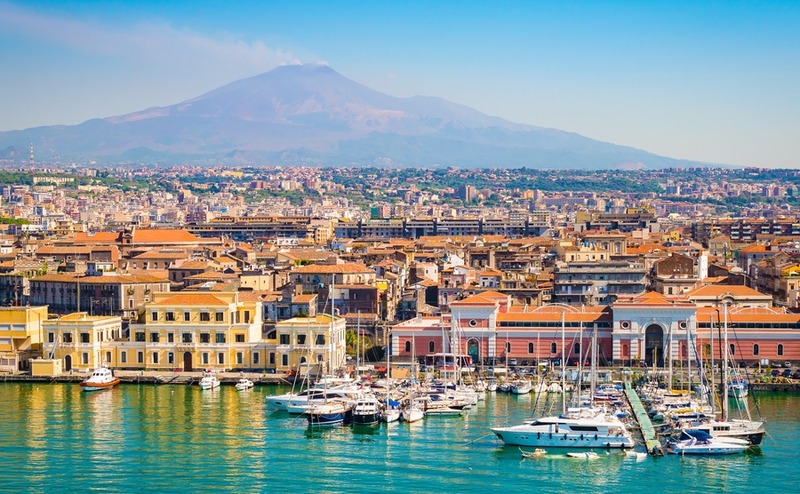 Sicily’s second largest city is Catania, a vibrant, lively town. It may be a bit scruffy round the edges but Catania’s historic centre is a UNESCO-listed wonder of palazzi and baroque piazzas. The town welcomes up to a million visitors at the beginning of February to the Festival of Saint Agatha. This large participation number reportedly makes it the third largest Religious Festival in the world. All along the coast and around Mount Etna you will find people living and holidaying by the sea. There are still plenty of properties for sale from town apartments to country farm houses with vineyards. Prices vary greatly, depending on the condition of the property and distance from the sea. There is even a futuristic two-bedroom villa for sale for just €100,000 that looks like it belongs on another planet. If you have been trying to gather the courage to make the move to Italy, listen to Yoda and Qui-Gon Jinn : “Do. Or do not. There is no try.” “Your focus determines your reality.” “May the Force be with you”. 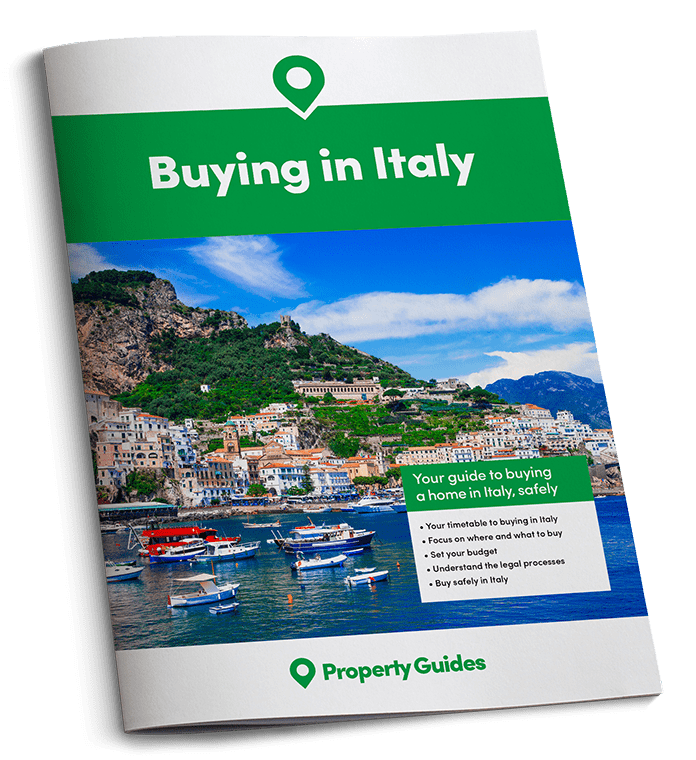 If you are ready to buy in Italy within the next few months, call our friendly Italy Resource Team on 020 7898 0549 or email Italy@propertyguides.com.